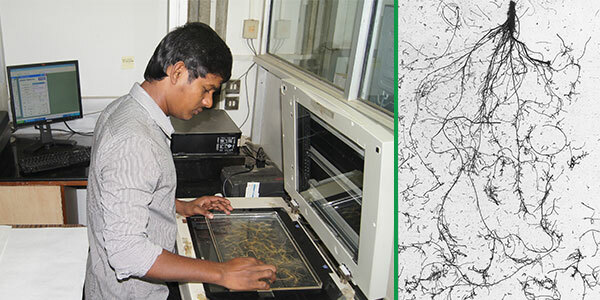 The soil sample containing roots are soaked in fresh water, about 10-15 mins, and are subjected to moderate tap water flush to form a suspension, and the roots are recovered by passing the soil-water suspension through a 2 mm wire mesh sieve (for, Field: Krishnamurthy et al., 1998; Purushothaman et al., 2015; Pot culture: Vadez et al., 2012; Hydroponics: Sivasakthi et al., 2016 - communicated; Tharanya et al., 2016 - communicated; Lysimeter: Kashiwagi et al., 2005; Zaman-Allah et al., 2011). Organic debris and weed roots are manually separated from sample root by floating them in trays containing water. The recovered clean roots are used for scanning. Recovered roots are spread cautiously to avoid overlapping to a maximum, on an acrylic tray with optimal water to ensure the complete root immersion. The tray size and root/tray positioning on the scanner should be maintained same for all the samples. Currently, Adobe Photoshop and WinRHIZO Pro are required to get a digitalized root images. Getting such digital images involves several steps in Adobe Photoshop. They are, Open Adobe Photoshop → Click “File” →Import→EPSONTWAIN Pro.→ A dialogue box will appear in which the Document Source, Image Type, Destination and Resolution can be assigned as same as in Figure 1. Fig.1: EPSON TWAIN Pro window in Adobe Photoshop. Click the scan icon to digitize the roots and wait for a few seconds for the scan to complete and the image to appear on screen. 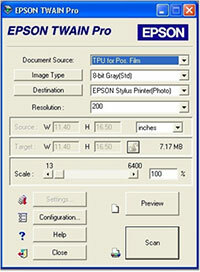 Close the EPSON TWAIN Pro window to save the image, using “save as” function, into a working folder as “TIFF” format with enabling Image compression “NONE” and Byte Order “IBM PC”. (Once the root image is acquired, each root samples should be wrapped using “scientific cleaning wipes” (Kimwipes) and kept in a paper packet for oven drying for 72 h to measure the root dry weight). 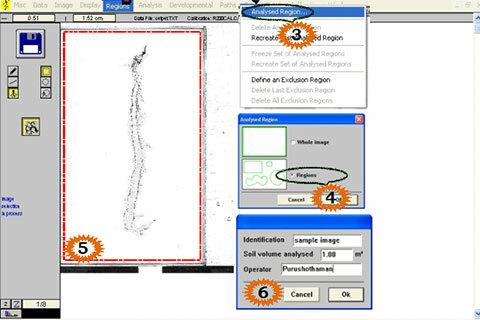 In general, the saved root images will be used in WinRHIZO Pro for analysis to obtain major root parameters such as root length, root surface area, average root diameter and root volume, etc. Analyzing the root images consists of three major steps. In WinRHIZO Pro, the principle to generate the numerical data on root parameters is to convert each pixel to actual length, e.g., if a pixel corresponds to one centimeter and the scanned image of root systems composed by 3 pixels, the root length is estimated to be 3 cm. To convert pixels to actual root length, the calibration file is required. 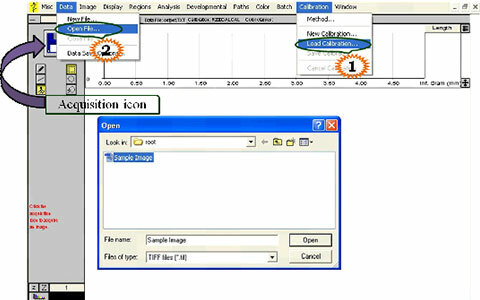 To assign the calibration file, Open WinRHIZO Pro → Click “Calibration” → “Load Calibration…” → select the calibration file “R200CAL.cal” available in the directory C:\WinRHIZO_Version 1993-2001. Before performing the image analysis, creating an output file is essential to store all the analyzed data points which are calculated from the root image. To create an output file, Click "Data" → "Open File" → assign a “file name” and “Save” in the same folder where you have stored all the root images. Select the area of interest (only the portion where the roots are present) from the whole image using cursor. This type of practice is time consuming as there were no batch analysis option available in this type of analysis and this issue can be solved using exclusion region analysis which is explained below. 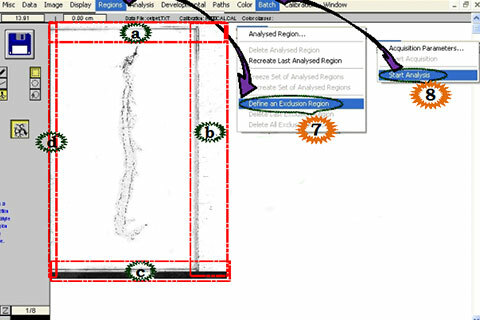 Steps involved in this analysis are: Click “Regions”→ “Analyzed Region” → enable “Whole image” (if the image is already cropped) or else “Regions” → enter “Identification” (sample name) for the image being analyzed and “Operator” information in the fields. Image analysis will begin after you click the “Ok” button. Analyzed data will be automatically saved in the output file which has already created. Repeat these steps for all the individual images to get the respective data points. Click “Regions” → “Define an Exclusion Region” → select a region that need to be excluded from the analysis (if there are multiple area has to be excluded from the analysis, click “Define the Exclusion Region” each time before going for selection). Once all the exclusions are done, go to “Batch” → Click “Start Analysis” and locate the folder where all the images have been stored. Analyzed data points will be automatically saved in the output file which was already created. Open the output file, copy and save it in Microsoft Excel. Along with the previously mentioned four major root parameters (root length, root surface area, average root diameter and root volume), root length density (RLD) was also considered to be critical and it can be calculated by the below mentioned formula. To do the cross validation process, a sample image along with its respective outputs will be given (attached - downloadable link) to ensure that your analysis was done properly.